Hawker centers (open-air, or at least open-sided food courts) first sprang up in Singapore during the 1950s. There are now more than 100 across the island dishing up delicious local comfort food dishes from hokkien mee (egg noodles stir-fried with egg, pork and prawns) to orh lua (oyster omelette), biryani (spiced rice with marinated meat) to fish head curry. 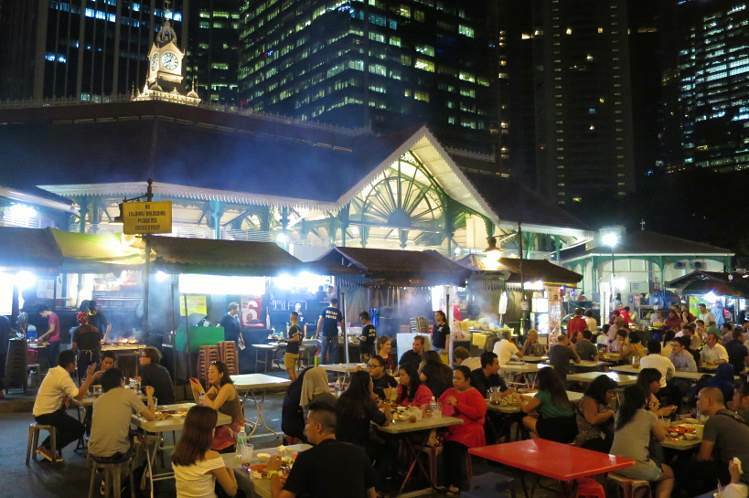 A national monument since 1973, Lau Pa Sat is a popular lunchtime haunt for CBD workers; every night at 7pm, an adjacent street is transformed into a chaotic outdoor restaurant resembling Singapore’s fabled former Satay Club – there’s only one meal you come here to eat. Not far away in Chinatown, Maxwell Food Centre is the place to go for the famous Tian Tian Chicken Rice (just look for the queue) while Old Airport Road serves some of the city’s cheapest chili crab. Hankering for a south Indian thali? Head to Little India’s Tekka Centre. And if you’re waiting for a bumboat to Pulau Ubin, stop in at Changi Village Food Centre next to the ferry terminal for seriously good nasi lemak (Malaysia’s national dish). More touristy Smith Street (Chinatown) offers a great primer on Singaporean food for newbies.